Could Samsung's Galaxy S5 Prime be called Galaxy Alpha? Last month, we posted several photos that allegedly presented Samsung’s unannounced Galaxy S5 Prime, which is supposed to be more advanced than the company’s current S5 flagship smartphone. Samsung already released a Galaxy S5 spin-off, namely the S5 Active, so an S5 Prime wouldn’t come out of the blue. 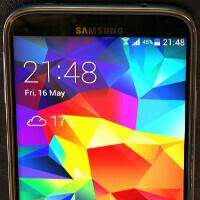 Still, the new handset might not be called Galaxy S5 Prime, and, in fact, it may not use the S5 moniker at all. Not long after we revealed the photos that supposedly showed (and still show) the unannounced smartphone, the editor-in-chief of SamMobile - a reliable source when it comes to all things Samsung - tweeted that the S5 Prime “might actually be the Galaxy Alpha.” Of course, that’s just a tweet that wasn’t backed by more details, and we shouldn’t make assumptions based on it. However, we discovered that Samsung recently filed a trademark application (in the US) for the Galaxy Alpha name - and this certainly gives some credit to the aforementioned tweet. The trademark application relates the Galaxy Alpha name to mobile phones and smartphones, among other things, so it’s definitely in the right category. Granted, this doesn't really confirm anything, but at least it tells us that the Galaxy Alpha name is, without a doubt, among Samsung's options for one of its future mobile products. The Galaxy S5 Prime (or Galaxy Alpha, or whatever its final name is) could be officially announced by Samsung this month, and we’re expecting it to be the company’s first Quad HD (1,440 x 2,560 pixels) smartphone. Until we hear more on this, you can see the alleged new handset in the slideshow below. Alpha is the first letter of the greek alphabet. It also means to be the most powerful or dominant. How does that equal cheap??? His means material not name. By doing this, Samsung is shooting its own foot. Because selling millions of phones per month rhymes with desperate. Sounds like a frat house. Whatever it calls doesn't matter to me as long as it is good enough. Not only you but we also. "We"??? Please dont bring me to your pathetic comunity..
Who told u that u r in our team.......we mean we not u. Then what ur doin here?? I see no nokia here?? Ooopss i forgot you have no life.. sorry..
Then how do I comment. prime aid, or cool aid..
Not drinking the cool aid sammy. I think your htc one m8 sales really needs aid..
Ok, and how much will this cost? 850.00 or 300.00 on a 2yr contract? As much as I bought the phone with the knowledge of this possibility, I don't (want to) believe it because it would be a very tacky move, and nothing like this has ever materialized before. The S5 is a great device regardless, but a flagship is a flagship. not sure about the whole flagship term, but currently the S5 is selling at 620 USD in my country (as comparison, Note 3 is 20 USD less) without any contract. the S5 Prime may be having a price tag of 700-750 USD when launch. But in reality they still have the same phones they bought. It's not like Prime is going to make their phones leak and lag. I'm still going to love my note 3 after note 4 comes out.